On August, 2012, in MOOC. Part of a MOOC is figuring out how it works. 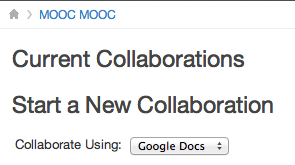 Our second day assignment was to collaborate with others on a document defining a MOOC. I go to the collaboration page and get this . No list of current collaborations. Update: This got sorted about an hour after I posted this. The Google Docs were manually set up, and I was asking the setter-upper at 4 AM his time. Things all going smoothly now, but foresee lots of time zone issues in a course this short.